La Cañada Flintridge is a small and affluent city in Los Angeles County, California, United States. 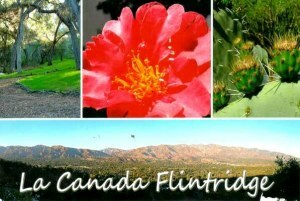 Part of the name for La Cañada Flintridge comes from the Spanish word cañada, meaning canyon, gorge, ravine. In Spanish, this has a tilde (ñ) and is pronounced "canyada" . "Flintridge" is simply pronounced as the two English words "flint" and "ridge", but does not refer to an outcropping ridge of flint.